Most of us know about the popularity of this karnataka style bisi bele bath recipe without any special explanation.I can never forget the pleasant remembrances of my Bangalore stay at my uncle’s(father’s younger brother)home.I was 12 when I was there for a long holiday that I thoroughly enjoyed the climate and playing with my cousin sisters.My aunt always cooks wonderful dishes that I love be by her side at her kitchen when cooking.The taste that still lingers in my mouth till now is this karnataka style bisi bele bath recipe. She served it with all love piping hot with some potato chips! it was out of this world.So,after my marriage I got the recipe from her and did it at my place! it was super duper hit.It will be super tasty when hot and the full enjoyment comes only from freshly prepared karnataka style bisi bele bath recipe.My aunt use to add green peas and me too will add if available,but this time it was not in hand.Any veggies of your choice is ok but if not do it as plain karnataka style bisi bele bath recipe. 1.Make the bisi bele bath powder as given and keep ready. 2.Soak tamarind take extract and keep ready. 3.Wash dal and rice add 4 cups water and pressure cook dal and rice together. 4.Cut veggies in big chunks and keep ready. 5.Now add some water and boil veggies in a pan by adding turmeric. 6.When half cooked add tamarind water and continue cooking. 7.When veggies are cooked add dal-rice mixture to this. 8.Add salt as required and add water to adjust the consistency. 9.Let it cook for 2-3 minutes. 10.Keep stirring now add masala powder. 11.Mix every thing cook for 5 more minutes. 12.Close lid and keep the flame low for 2 minutes. 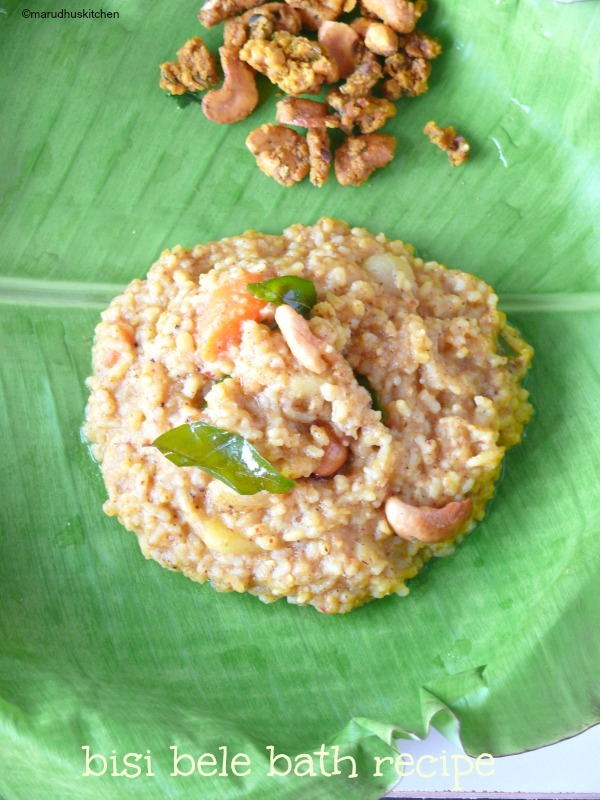 13.In-between make tempering with cashews and curry leaves in ghee add to the rice. Make the bisi bele bath powder as given and keep ready. Soak tamarind take extract and keep ready. Wash dal and rice add 4 cups water and pressure cook dal and rice together. Cut veggies in big chunks and keep ready. Now add some water and boil veggies in a pan by adding turmeric. When half cooked add tamarind water and continue cooking. When veggies are cooked add dal-rice mixture to this. Add salt as required and add water to adjust the consistency. Keep stirring now add masala powder. Mix every thing cook for 5 more minutes. Close lid and keep the flame low for 2 minutes. In-between make tempering with cashews and curry leaves in ghee add to the rice. If not using ghee use Gingelly oil. Both dal and rice should be cooked right till soft,not too much(gooey) so that when we add to veggies its going to cook further and will come to right consistency. When adding tamarind be careful as it may become too tangy. You’re doing it wrong: Does food and drink need to be authentic to be good? This is my most fav dish from this cuisine…Loved it! !